The Potter | Dr. Justin Imel, Sr. When I wrote about the negative things I have learned from my illness, I noted that doctors are not God. God is God. God alone is God. No created being can take his place. He sits in majesty on high. Man, however, for one reason or another always thinks that he himself is God. You have considered yourself to be God and I most certainly have thought of myself as God. You see, any time we sin, we place ourselves in God’s position. We claim that we know more than he, that we are more righteous than he, and that we can deal with any situation better than he. In fact, the word SIN has I in the middle. All sin has “I” in the middle. Sin is trading what God wants for what we want. There are a special breed of people who think they are God — atheists. It never ceases to amaze me how little they understand of the God of Scripture. They believe caricature of him based on someone’s faulty information. I want to focus on one aspect where atheists miss the boat in a major way: the problem of pain and suffering. I know pain and suffering. Every morning I wake up in pain. Some mornings I lie in bed for about an hour. Why? Not laziness; I love the opportunity to share God’s truth. Not because I have nothing to do; my days are crammed right now and finding adequate time to fulfill all my obligations is troublesome. I lie in bed because of the pain. I know that the minute my feet hit the floor, hellish pain will be all through my lower extremities. Not fair, is it? My brother runs the Saint Jude Marathon each year, and my wife and I always find a little to contribute. We always think about should, God forbid, we need the resources of a hospital for one of our boys, we’d want every resource on the face of the planet. I’ve never walked the halls of Saint Jude’s Hospital, but my brother has. He has wept telling us of the torture, the pain, and the pure hell the children and their families are facing. Not fair, is it? Why? Why does a perfect and loving God allow such misery on this earth? I dealt with that question some last week, but today I wish to tackle some foolish thinking (atheists are fools, remember [Ps 14:1]?). If you talk about the goodness of God with a non-believer, he will likely ask you about Hitler or about childhood cancer or about starvation in Africa. If God is so good and so holy and so powerful and so badly wants what’s good for man, why does he permit such evil? A holy and powerful and righteous and good God would not permit such things in this world. Says who? Who says that a holy and powerful and righteous and good God would not permit evil in this world? It’s not God. It’s not his Word. It’s not his Son. It’s not his people. It’s the non-believer who thinks he can make God in his own image. He thinks he can stand in judgment of God. He thinks he can tell God how to act. He thinks he can tell God how to think. He thinks he can be God himself. What creature has the right to tell the Creator how to run the world? “Who are you, O man, to answer back to God? 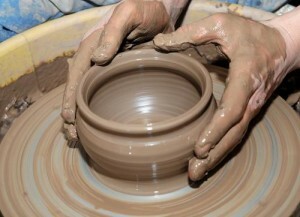 Will what is molded say to its molder, ‘Why have you made me like this?’ Has the potter no right over the clay, to make out of the same lump one vessel for honorable use and another for dishonorable use?” (Rom 9:20-21). No, you cannot tell God how to operate. It is he who made you, not the other way around. The honest truth is that I am not God. God is God. There are many things I do not understand about this world and especially about pain and suffering. But, I do know this: I’m going to allow God to be God. This entry was posted in Faith, Family, God, Health care, Hope, Pain and tagged Bible, church, God, Jesus, Pain, pain and suffering, truth. Bookmark the permalink.